Give Me Literature or Give Me Death! I am a busy mom of four young kids. I struggle to find time to manage the onslaught of daily redundancies, even with my new temporary stay-at-home-mom status. The making of breakfasts, lunches, and dinners. The meetings and school events. My return to writing has fulfilled a part of me that felt like it was dying, since we relocated. Most people think me to be so strong and independent, which is flattering but lonely at times. But our choice to move was a planned one. Carefully, well… obsessively researched and calculated. It was a gamble, but not of the reckless sort. So we have settled. I have found my voice again. I have spoken up about things that matter to me most. In a short time, I have developed a blog, that may not shatter any records or make any money….but it has a following of readers. It is encouraging to see the stats rise all day. The fact that 200-500 times on any given day, my words and thoughts are pulled up on someone’s computer or phone screen. But my reading has become so shallow, that I feel my mind getting restless. For weeks, I have read and read and read on my phone and laptop. Article after article about high stakes testing, Pearson, the Common Core, child development theory, the opt out movement and anything remotely related. What I read was fueling my writing and my urge to educate others about the dangerous road down which education is headed. But all of this reading was giving me anxiety and making my brain feel like a rodent on a wheel. For years I taught 7th grade English and motivated my students to read 20 books outside of class. I was alone in this. My colleagues didn’t require as many, in fact several did not require any reading outside of class at all. But it felt right to me. I didn’t want to “teach English”. I wanted to inspire the creation of life long readers. I didn’t make my students write 20 book reports. Instead they kept journals full of sticky notes, where they wrote their thoughts as they read. Every 2 weeks we went to the school library, and while they chose a new book and read, I read their thoughts. Did every child love the assignment? No. Did every student read 20 books? No. Did I give “reading detention” to a few kids over the years out of frustration and desperation? Yes. Did I make my students with I.E.P.’s (special education) and ELL (English Language Learners) do it too? Yes. Did I have parents complain? Yes. Did I have parents read books and forge sticky notes for their kids? Yes. Did I have parents write me letters thanking me for inspiring their whole family to read more? Yes. The project became a big part of my legacy. From year to year, I would ask at Back to School Night how many parents heard about my book project, and many sheepishly raised their hands. I would have parents come up to me that same night and tell me that their child would never read one or two books, let alone 20!. Many of my students said the same thing. The number 20 seemed like torture. But in my last year teaching, I created a bulletin board. 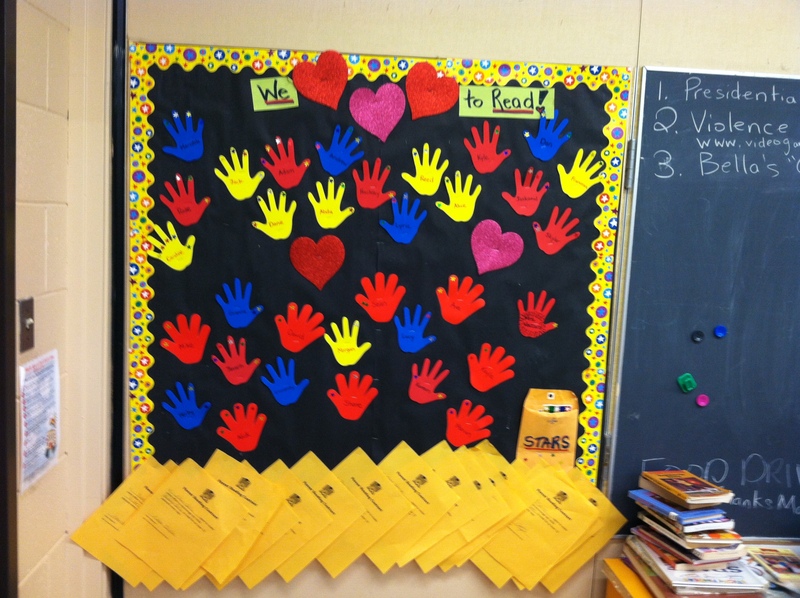 Each student was given a paper hand, and they wrote their name in the center. Each time they read a book, they put a star sticker on it. The board was right near my classroom door, and it quickly became the hang out. Kids were talking about their progress. Talking about what they were reading. Egging each other on. And I couldn’t have been happier. I even put a hand up there with my name on it. I said I would read 20 books too. In fact for the 8 years that I taught 7th grade, I made the same promise. And for 8 years, evaded the few kids who asked me how many books I was up to. Each year I started strong, even posted notes just like the kids had to. But as the year wore on and my responsibilities and stress grew, I lost motivation and gained excuses. I wouldn’t say I lied to the kids, but I certainly wasn’t honest. I told myself that my intentions were good, so it didn’t matter if I really finished. I had read more books in my life than most people. I already loved to read…life just got in the way. But that year with the bulletin board, I had a visual reminder of my failure, as the kids laughed at my hand with only 3 stars on it. I couldn’t bring myself to add stars for books I didn’t read. So instead I talked to my students honestly about how lucky they were to have time to read. To not have the obligations and stress that adults have. I told them about the stacks of half read books on my nightstand with receipts as bookmarks sticking out from the pages. I told them that my idea of a vacation would be to lay in bed for days and read, like I used to before I had kids. I told them about how I read A Thousand Splendid Suns by, Khaled Hosseini, which is 384 pages long, in one night, because I just could not put it down. I described how I cried like a baby while reading to the point where my husband thought I was crazy. I told them that for the first time ever, I had shut the book and closed my eyes, because I couldn’t bear to “see” what would happen next. But as I told them these stories, I still couldn’t help but feel like I failed. Tonight, I realized that the only person I failed in that situation was myself. For my guilty confessions showed my students what it meant to truly love to read. It showed them that reading could be like a dessert that you couldn’t eat, though you would love to. My words and emotion turned reading from a chore or an assignment into something more. Even if it wasn’t dessert for them, they could see how it could be for someone else and that was a step in the right direction. I failed because, I didn’t make the time for myself to do what I love. After being submersed in the politics of education reform, tonight I sat down to read one of the three books I received as gifts for Christmas (admittedly one of them I gave myself on a whim while in the book store shopping for my kids). The first few pages of The Book Thief by, Markus Zusak made me realize all at once that I have been depriving myself of what I love most. The narrative voice is incredible. I felt immediately grabbed and pulled into the book in a way so powerful and delicious. The most well-written article is nothing compared to a majestic literary voice. It is truly an art. I had to pause my reading to write this, but I promised myself not to write another post until I finish the novel. I am anxious to go savor the book until I pass out from exhaustion or one of my kids wakes up with a nightmare or something. You see the makers of the Common Core have placed such value on informational text, because it is what most adults read these days at work and for pleasure. But I have to say that perhaps that is exactly what is wrong with adults these days. They are reading the wrong things. If you fill your brain with information day in and day out, you become nothing more than a depository. Literature is thought, imagination, culture, and passion. Why would we want to deprive our children of these things? To make them career and college ready? I would much rather have education light a fire than fill a pail.